Looking for the best snake repellents in 2019? Then you're in the right place! Out of the snake repellents we reviewed, we really liked the Ortho Snake B Gone as it is a non-lethal environmentally friendly option. The repellent comes in a shaker ready to be sprinkled around your yard. We recommend you find the snake's nesting area (check bushes, shrubs, etc) and apply the repellent there as well as create a barrier around your property. If you want a more potent option, we also like Dr. T's snake repelling granules. They use a more potent chemical formula, which consists of mostly sulfur and naphthalene, which is toxic and should be avoided after application around your home. Please remember that snake repellents are not 100% effective and some snakes will still be able to cross an applied area. Snake repellents should be used as apart of a larger pest control plan. If you're interested in learning more about snake repellents or want to read more about the other products we considered, see below! What Makes a Snake Repellent Good? Snake repellents are products designed to stop serpents from entering a protected property. They can be sprinkled or sprayed around a yard, and some companies developed sonic repellents. Some repellents are more effective than others, and this guide can help you separate the wheat from the chaff. Snakes frequently wind up around homes because they provide ample food and shelter. Many of them catch pesky pests like slugs, mice, and other rodents. They can be beneficial creatures, but sometimes they might pose dangers and risks if they bite humans or start to terrorize pets. To combat them, manufacturers developed snake repellents. Some more environmentally friendly repellents use essential oils instead. These include cinnamon, castor, peppermint, clove, and other strong-smelling ingredients. As mentioned earlier, chemicals have distinct scents designed to be unpleasant for snakes. While serpents have nostrils and a typical nose, they don't use it often. If they find something interesting, they will sniff it and then flick their tongues. Their tongues can pick up odor particles which are then sensed by special organs in the mouth. These organs are called the vomeronasal organs. Some chemicals are also toxic or can hurt a snake, which means it will avoid the area. Sonic repellents supposedly generate noise at a frequency which is hard for humans to hear. Serpents detect the frequency. The noise is unpleasant and irritating, so snakes will again not enter a property affected by the sonic repellent. What Are the Risks of Snake Repellent? Some repellents are toxic to animals and cause serious problems or death. Ingredients such as naphthalene damage the nervous system. It is also considered by the Environmental Protection Agency to be a carcinogen for humans. Carcinogens are products which potentially cause or increase a person's likelihood of developing cancer. People can avoid these problems by using environmentally friendly or sonic repellents. There is a large amount of diversity in snake repellents. The three factors people should look at are strength, effectiveness, and overall cost. Some repellents can withstand the elements while others will be affected by rain, wind, or other factors. Some formulas will also last longer than others, so it's important to pay attention to the ingredients. Effectiveness can be determined by how many snakes the repellent handles. Some products will only work on certain species of snakes, while others affect a broad range of serpents. As mentioned earlier, some products will also only last for a few days and will need to reapplied. Others can be kept for much longer. How Much Does Snake Repellent Cost? Products can range between $8 and $60 depending on the ingredients and whether or not the repellent relies on electricity. Electric or sonic repellents tend to last longer and are therefore more expensive. As with most repellents, they are usually not 100% effective. As their name implies, they repel, not physical stop animals from crossing. In our review of other field tests of popular snake repellents on the market, they are not 100% effective. Snakes can definitely sense and smell that there is something they don't like, which does slow them down, but they'll still likely cross the barriers you create. Your best using snake repellents as apart of a bigger pest control plan meant to reduce a snake population around your home. Here's a great video we pull that demonstrates how a snake will react when confronted. 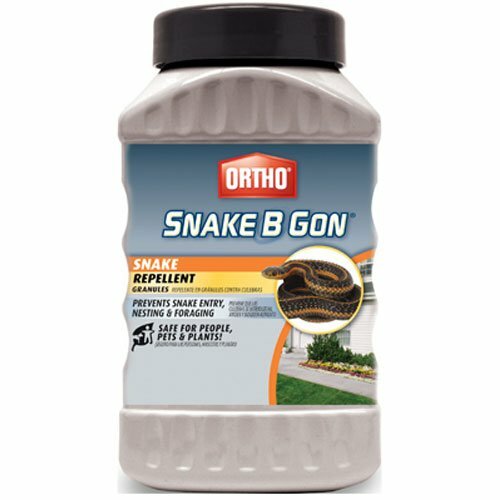 Ortho Snake B Gon Granules is a cheap option for people suffering from snake infestations. A full bottle is relatively inexpensive and can be applied around a property quickly. The mixture uses essential oils and relies on a snake's sense of smell and taste to prevent slithering invaders. Humans usually can't smell the granules and can safely place them around the home. Ortho Snake B Gon is environmentally friendly and comes ready to use. It will not harm plants, so it can also be safely placed in gardens. 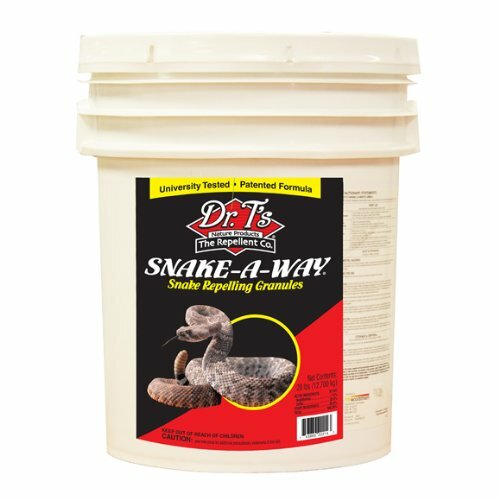 I would recommend this product to people who want an inexpensive, green way to prevent snakes from slithering around. Some people want a strong snake repellent, and Dr. T's Granules fulfill this desire. The product uses traditional ingredients like sulfur (28%) and naphthalene (7%), which create an unpleasant odor. Snakes who attempt to cross the granule barrier will also experience nervous distress or even death. The product claims to be effective on all types of snakes and comes in a large package at a decent price. 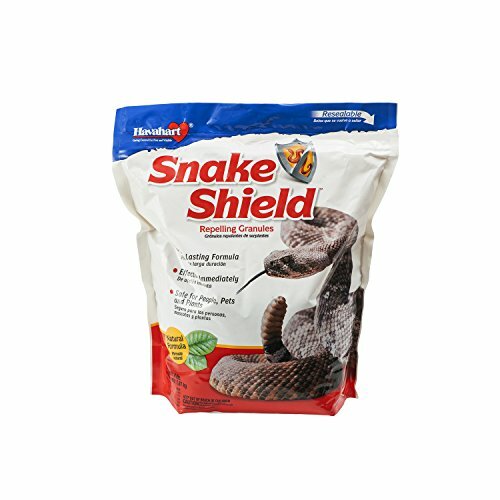 We recommend this product to someone who has a serious snake problem and doesn't mind harming invasive serpents. The product is not environmentally friendly and should be kept away from pets and children. We also recommend you go for the bigger package, but if you need a budget option this is also a good option for Dr. T's. One bottle of Exterminator's Choice Natural Snake Repellent is a bit more cost friendly and can make a 3 ft. barrier around a property. The product uses various essential oils (clove, peppermint, & cinnamon oil) and relies on a strong odor to keep serpents away. Users can spray the mixture without needing to touch any of the product. Exterminator's Choice is environmentally friendly, is okay for most pets, and claims to work on venomous and non-venomous snakes. This should work well as an alternative to granule treatment if you don't like the idea of spreading little bits of poison around your lawn. Snake Shield works as another option for property owners who want to use an environmentally-friendly alternative to traditional chemicals. The product uses oil extracts from plants like cinnamon or cedar to create an odor unpleasant to snakes. The granules can be spread around the edges of a property and will form a barrier. Take a look at the below video of a user showing how well this brand works. We personally don't think this test is entirely fair as the snake is essentially trapped in a circle and is forced to confront the repellents, but have a look for yourself. Each package contains 4 lbs. of granules. They are non-lethal and won't hurt plants or animals. 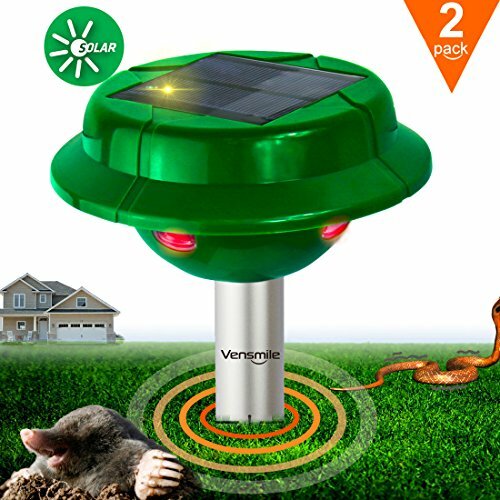 The VENSMILE Snake Repellent is a little different than the other's we've looked at so far. This is a small device sold in packs of two. They have stakes which can be placed in the ground. Every 55 seconds, the repellent vibrates and sends the waves through the ground, where they can be felt by snakes. Serpents do not like the frequency and will avoid going near the repellent. VENSMILE is a great option for individuals who want an environmentally friendly alternative to traditional chemical repellents. 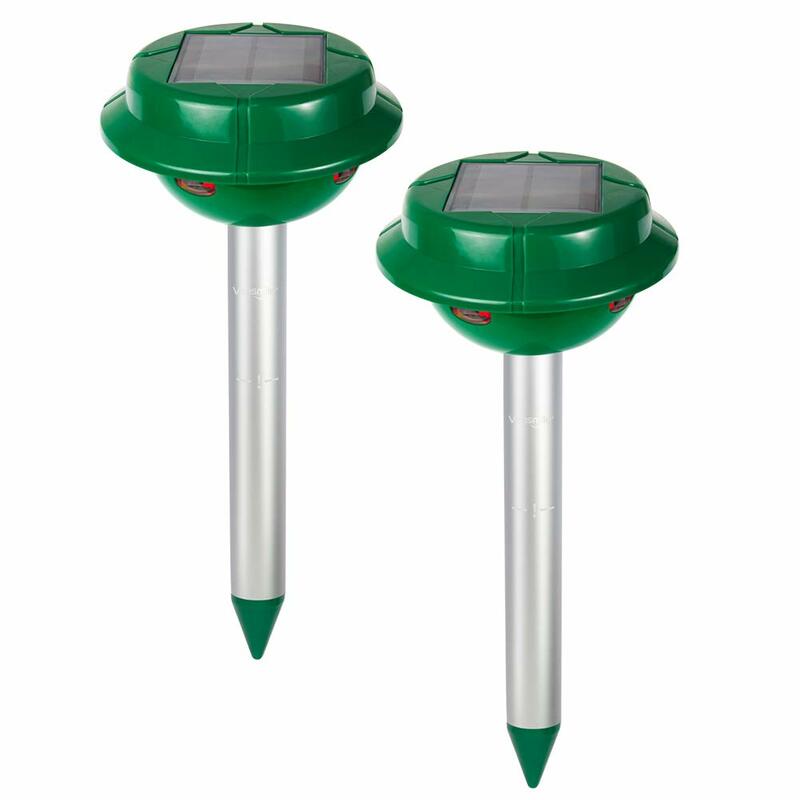 The devices are solar-powered, so they don't require an electrical connection. Its emissions can cover a large area of 7,500 sq. ft.
People will have different needs when it comes to snakes. Some might want to kill invading predators, while others might just want a deterrent.